"The entire day was wonderfully organized, information packed, and FUN! I'm ready to do my demo now!" "Best workshop I've ever attended on any subject. without a workshop like this. "The perspectives & tips from multiple coaches was excellent. I learned more than I thought I would. "Learned what my last coach DIDN'T teach me. A big help in updating my current demo. "Getting in front of several successful voice over talents and coaches was invaluable." what it takes to be a VO talent now. OK to come late or leave early–just don't miss it! from an all-you-can-eat buffet? A recent Gameshop. This fun, friendly "gameshop" will provide a great experience for all levels of skill and is open to all, no experience necessary. Learn both beginning and advanced games and forms accessible to everyone. While we'll point out how what you do can benefit voice performers, anyone can join and have a great time! Professional voiceover artists begin creating their performances with no rehearsal, just moments after seeing copy for the first time. So improv and voiceover are two of the most similar of the performing arts. They are both instant theater. But improv is also a set of life-long tools you can use every day. It builds confidence, sharpens communication skills and helps you think on your feet—all great assets for voiceover talent! You'll learn to perform instinctively and spontaneously, and discover ways to be more genuine in the present moment. Have fun building lifelong performance skills. Learn to trust your point of view, performance choices and creative ideas by taking risks in a safe and supportive environment. Getting in tune with your creative and innovative side makes you a better performer by bringing your knowledge, experience, point of view and tastes — who you are — into your performance. 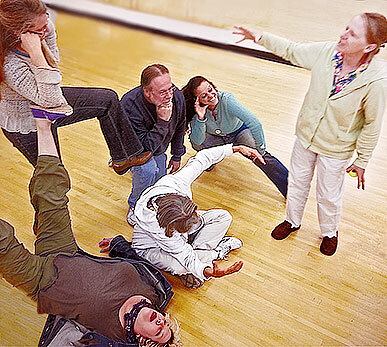 By providing a fun and supportive environment for finding your creative voice, improv also helps some people find a greater sense of well being, and can ease social anxiety. Find higher levels of creative thinking and problem solving as you learn to communicate your ideas more effectively and work with others through these fun games and exercises. 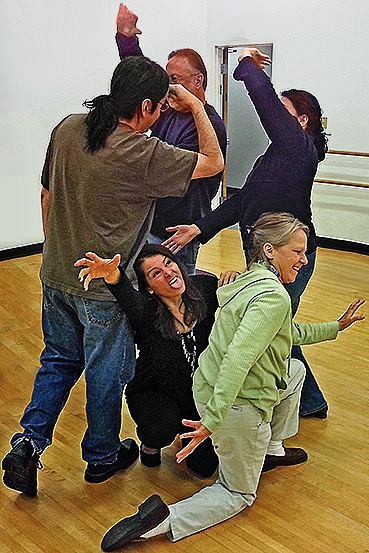 "Keeping the zombie in the vortex"
Meet some of the most fun people in voice over. Join us in this inventive, in-the-moment class for creative growth and confidence building.